﻿Look who's on Yoga Journal June issue, page 79! 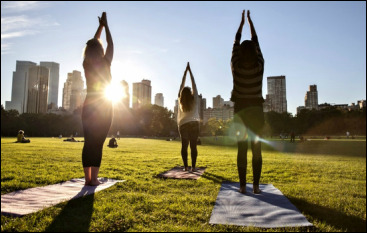 Central Park’s bucolic Sheep Meadow is an official park Quiet Zone, and as such the perfect place for yoga. Silvia Neri leads weekday evening classes (Mon–Thu 6:30–7:45pm), and morning classes at the weekends (10:30–11:45am). theyogatrail.com. Class $15, mat rental $4. NYC’s 10 most incredible outdoor yoga classes this summer! Silvia, the founder of The Yoga Trail is on Yoga Magazine again! 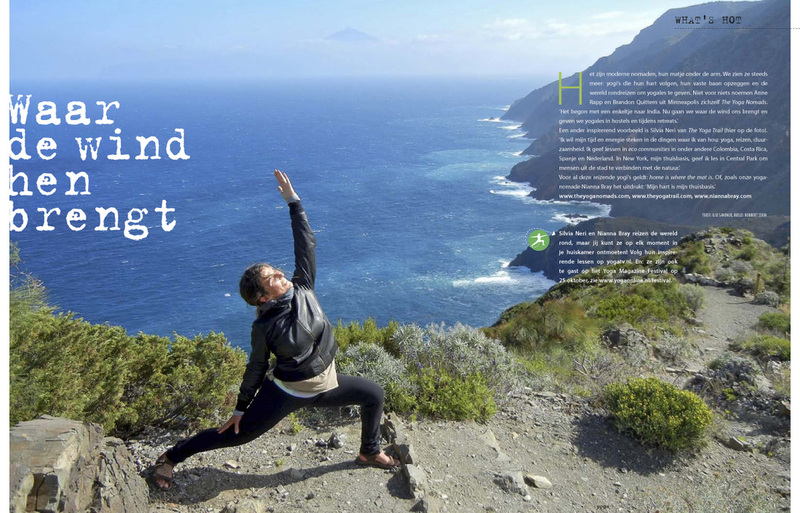 This time on a fully double third page in an article about traveling yogis! "Modern nomads with their mat under their arm. We see them more and more : yogis who follow their hearts , and tour the world teaching yoga. Not for nothing Anne Rapp and Brandon Quittem Minneapolis called themselves The Yoga Nomads . "It began with a one-way ticket to India. Now we go where the wind takes us and we give yoga class in hostels and during retreats . " Another inspiring example is Silvia Neri of The Yoga Trail (pictured here) . "I want to devote my time and energy to the things that I love: yoga, traveling , environmental sustainability. I've been giving yoga classes in eco communities around the world, including Colombia, Costa Rica, Spain and the Netherlands. In New York, my home , I teach in Central Park to help city people connect to nature. " For all this traveling yogis the truth is: home is where the mat is. Or, as our yoga nomad Nianna Bray puts it : "My heart is my home ." The Yoga Trail in Central Park in on Marie Claire Hungary! Interpreted from Google translate..." Silvia Neri is leading the Yoga class in this beautiful lawn. She's been living in NY for 10 years, and offers Yoga to let go of the thoughts and stress of work and errands to focus on the present moment, fully connecting with Nature. The park is the best place for it, as you can imagine. You can see the wide sky and the skyline of the city in the distance at the same time." "A yoga instructor can experience the best of Central Park essence. After all, the park is not always quiet: sometimes there are concerts, events, curious dogs or children playing, and they all contribute to the beautiful energy of the park. For instance this time the Yoga class shared a few minutes with a dozen people jubilantly cheering at a nearby advertising set!" The Yoga Trail from New York is coming to Amsterdam. The New York based group The Yoga Trail is making its first visit to Amsterdam. This October and November they offer Vinyasa Flow Yoga classes at several locations in Amsterdam. The classes are led by Silvia Neri, founder of The Yoga Trail. Last Sunday the Amsterdam tour started at creative hub De Ceuvel where Silvia gave her first yoga class at a special location: on top of an Amsterdam house boat. More HERE!